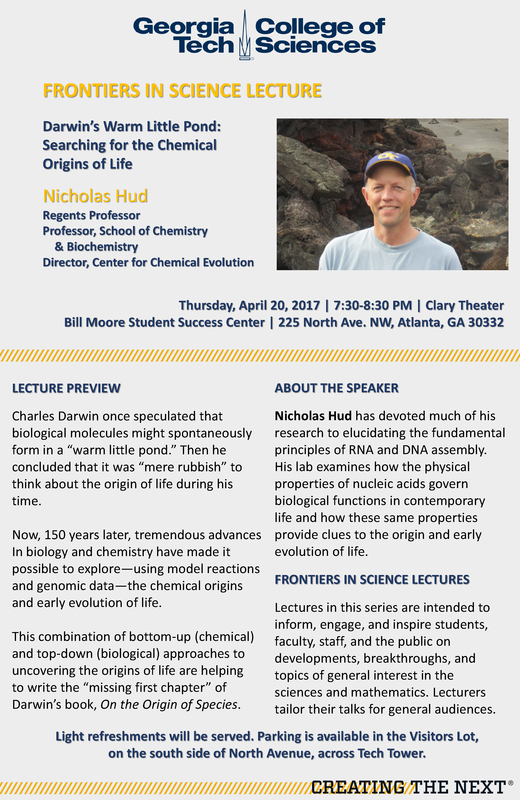 Full Summary: Regents Professor Nicholas Hud, a leading researcher in the origins-of-life field, will discuss how scientists are helping to write the "missing first chapter" of Darwin's book, On the Origin of Species. Charles Darwin once speculated that biological molecules might spontaneously form in a “warm little pond.” Then he concluded that it was “mere rubbish” to think about the origin of life during his time. Now, 150 years later, tremendous advances In biology and chemistry have made it possible to explore—using model reactions and genomic data—the chemical origins and early evolution of life. This combination of bottom-up (chemical) and top-down (biological) approaches to uncovering the origins of life is helping to write the “missing first chapter” of Darwin’s book, On the Origin of Species. 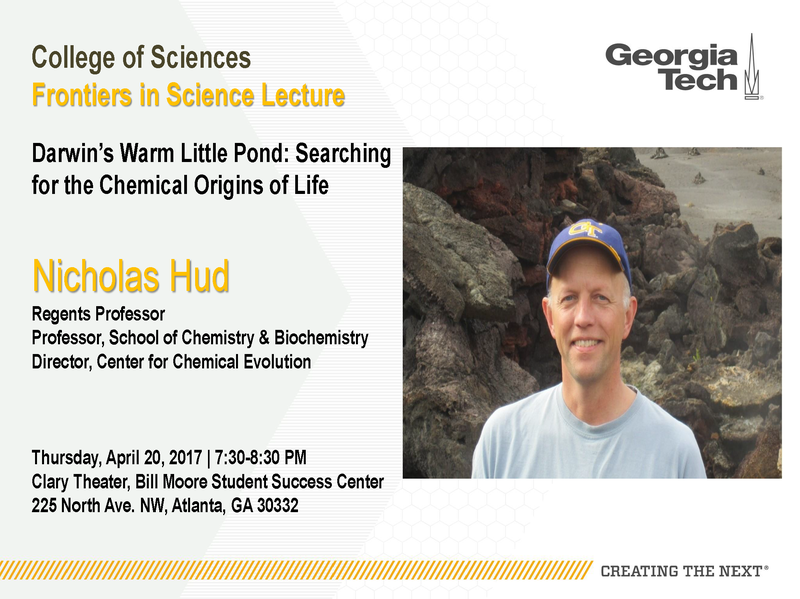 Nicholas Hud has devoted much of his research to elucidating the fundamental principles of RNA and DNA assembly. His lab examines how the physical properties of nucleic acids govern biological functions in contemporary life and how these same properties provide clues to the origin and early evolution of life. Lectures in this series are intended to inform, engage, and inspire students, faculty, staff, and the public on developments, breakthroughs, and topics of general interest in the sciences and mathematics. Lecturers their talks for nonexpert audiences. Parking is available in the Visitors Lot on the south side of North Avenue, across Tech Tower.